Our Intern Tucky sits down with Designer Briana Fanzone to discuss her work on the brochure for the BlackRock Center for the Arts located in Germantown Maryland. We created this project for Signera with flexibility in mind. Signera produces a web-based digital sign application that uses a growing number of modules to control the content displayed. The project will be used as a DVD or sales presentation. We created the project in Microsoft Powerpoint and Adobe Photoshop. By using Powerpoint, Signera will be able to update the project themselves, if necessary. Signera also allows resellers to sell the product under their own name. This will allow us to rebrand and repurpose the presentation for multiple resellers. Our Intern Tucky sits down with Designer Amy Guessford to talk about her work on the cover of Author Sarah Stup's new book NEST FEATHERS. Our Intern Tucky interviews JPD Graphic Designer Megan Mullaney about her work on the Hope Alive Web Design Project. Join our intern Tucky, as she takes you on a tour of the new Jean Peterson Design office in Everedy Square. 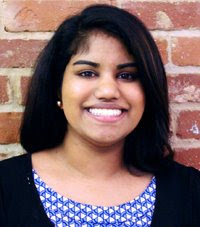 Thakshila “Tucky” Dangamuwa will join our team at Jean Peterson Design of Frederick, Maryland as a summer intern. A resident of Frederick County and a junior at Marietta College in Ohio, Dangamuwa is majoring in marketing with a minor in history. This summer she will work with the designers at Jean Peterson Design to gain experience on marketing and pr projects. While at Marietta College, Dangamuwa has been an active member of Alpha Xi Delta, an organization that inspires women to realize their potential. She was chosen by her sisters to be their representative on the Student Senate and this past year she helped develop and publish Marietta College’s first Greek Community Newsletter. Most notably, Dangamuwa became a member of the Model UN where she represents the school in the DAYMUN and LEMIUM Conferences and is taking part in a Leaders in Action Program. 1 DON’T rely on dated or overused color combinations. Complimentary colors may have worked in first grade art class, but why limit yourself? Explore other designs and websites to determine what color schemes are more appealing than others. Browse a variety of inspirational sites such as The Best Designs, Design Meltdown, The Dieline, and Design Sponge. 2 DON’T be inconsistent with your color usage. Color is an important branding tool – when used correctly and consistently, it can increase memory and engage your audience. According to the Color Marketing Group, color increases brand recognition by up to 80%. 3 DON’T forget about readability when combining color with type. Black text on a white background may be easiest to read, but it doesn’t mean that color and type don’t mix. If used well, color can emphasize your message. The contrast between text color and background color must be considerable to ensure that type remains visible. It’s wise to make light text on a dark background (such as white on black) a little heavier, as dark backgrounds tend to optically reduce the weight of text. 4 DON’T be afraid to experiment with color. Sometimes even the forbidden color combinations work. There are various online color tools to inspire color combinations, such as Adobe Kuler and COLOUR lovers. Sites like Color Palette Generator and Color Hunter produce color palettes from user-uploaded photos. 5 DON’T forget that the appearance of colors can change according to their surroundings. A large block of color on a white background will appear darker than a thin line of the same color on a white background. Any color will appear lighter against a darker color and vice versa.